The number of true believers in the coaching ranks may be dwindling every year, but the instances of borrowed ideas and adopted concepts continue to increase. Is the triple option really dying, or is its influence on the college football landscape only getting more persistent? This is the 45th consecutive season in which the Wreckin’ Rams are operating in the same triple option offense that then coach Bill Dotson installed in 1974. The Veer has survived three head coaches, each passing down the offense to his successor, like a family’s most precious heirloom. The Veer is unchanged, having weathered the storm of new-fangled, pass-happy schemes, and now it is flourishing like never before: dominating smaller defenses built for modernized spread schemes, bludgeoning foes with a mystifying wizardry only possible in the triple option and delivering Acadiana four state championships in the last 12 years. In another vestige of a bygone era, last Saturday college football fans scrambled to find a legal or illegal stream for a game that was only available as a pay-per-view, as mighty Oklahoma sweated out an upset bid from Army. The Sooners came in with one of the nation's fastest and most potent offenses, directed by a rising star coach in Lincoln Riley, whose brain has been picked relentlessly by NFL scouts after producing a Heisman Trophy winner and a College Football Playoff berth in his first year in charge. But it was the Black Knights who controlled the game when they had the ball, stringing together four drives of at least 16 plays each, dominating the possession battle (44:41 to 15:19), frustrating the Oklahoma defense to the tune of 339 yards rushing and 13 third-down conversions, and earning the respect of everyone who successfully found a reliable stream. Just like the old days, the college football world was focusing all of its attention on an offensive system born way back when Army was the national power that Oklahoma is now. "This Army team is tough,” said Sooners linebacker Curtis Bolton after Oklahoma escaped with a 28–21 overtime win. “You can say what you want, the triple option is a little outdated but at the end of the day those guys are trying to win a football game." The core value of the triple option is simple: out-number the defense, 11 players to 10, by reading a defensive player's movement instead of blocking him and employing your quarterback as a runner. Free from his blocking responsibilities, maybe that extra offensive player can double-team an All-America defensive tackle, or reach block an all-conference linebacker, and open a hole no teammate is fast or strong enough to open by himself. The zone-read, a kind of double option, has swallowed high school and college football for nearly two decades, but its bigger brother the triple has maintained a persistent presence at both levels of the sport, even as the number of teams that exclusively operate out of it dwindles. Navy, Army and Georgia Tech run the option in its purest form, using their offenses as battering rams operated from under center. At Air Force, Calhoun has tweaked the formula slightly, mixing the spread option with the under-center triple that the program has run for years. Most other schools that employ some classic features of the option have modernized and cloaked them within spread concepts, as Fritz has at Tulane, Bob Davie has at New Mexico and Scott Frost has begun to at Nebraska. These new strains of option football surpass their ancestors in charm and glamour. Some believe the original under-center versions of the scheme are on the verge of complete extinction. Even a few inside the small fraternity of coaches who run the system agree that the triple option as they know it is an offense in twilight, soon to be replaced completely by those refurbished spread option systems, many of which are derived from the offense Fritz and his offensive coordinator Bob DeBesse created six years ago at Sam Houston State. Is the old-school triple close to death? That may depend on how you define death. 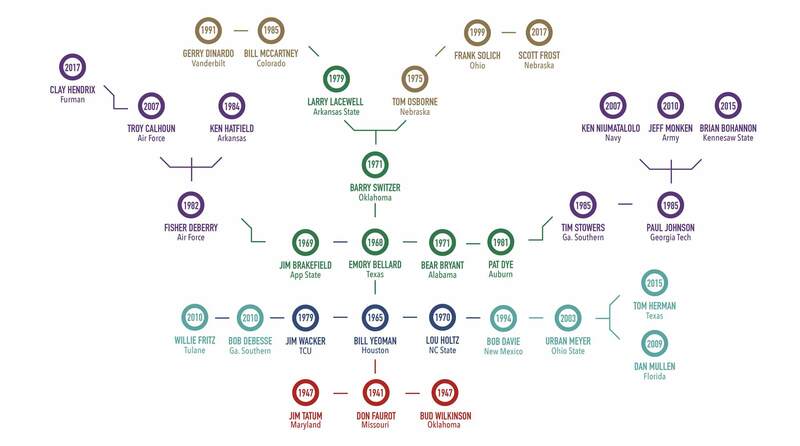 Sports Illustrated traced the roots of option football through its 70-plus-year history, using more than 40 interviews with former or current option football coaches to document its alterations and link together its innovators. Each coach above is identified by the year he took an active role in the dissemination of the option, the program he currently runs or is best known for influencing, and the option scheme his teams were known for. (Scheme key: Split-T—red; split-back Veer—dark blue; Wishbone—green; Flexbone—purple; I-option—brown; spread—turquoise.) Scroll down for the full timeline of the option’s rise. Johnson’s coaching descendants, along with contemporary innovators like Fritz and DeBesse, are only the newest branches to sprout from an option coaching tree with roots back to World War II-era football. The path from then to now has been far from linear. Did you know, for instance, that legendary Houston coach Bill Yeoman discovered what many consider the first true triple option, the split-back Veer, in the mid-1960s because of a missed blocking assignment? Or that Texas offensive coordinator Emory Bellard refined his revolutionary Wishbone using his teenage son and his friends as props in the family’s front yard? Colorado’s national title in 1990 and the three won by Nebraska later that decade can be traced to, of all people, Big Eight rival Barry Switzer. Johnson’s system at Georgia Tech has a link to figures on both sides of the Iron Bowl in Alabama's Bear Bryant and Auburn's Pat Dye. DeBesse played in coach Jim Wacker’s Veer attack at Southwest Texas State in the ’80s, and Frost quarterbacked Tom Osborne’s I-option attack at Nebraska in the mid-’90s. Meyer, then the up-and-coming head coach at Utah in 2003 and ’04, often phoned the Navy football offices to pick the brain of Johnson, who had improved the Midshipmen from two wins in year one to eight wins in year two with an option offense that was all the rage 25 years prior. Meyer wanted in, or at least part of the way in, looking to incorporate some of Navy's concepts in a double option zone-read system that would eventually make him the toast of college football. The option family is always fighting the ham sandwich label—productive, but plain; sustainable, but simple. The golden years of the option faded away for recruiting reasons as much as any other. Option teams claimed one-third of the national championships from 1950 to ’79. Then, gradually, dozens of coaches dropped the system in favor of variants of BYU’s West Coast offense, Steve Spurrier’s Fun ’n' Gun, Mike Leach’s Air Raid or Meyer’s spread scheme, in an effort to woo teenagers with flash. The option has famously helped close a talent gap at the three service academies, where recruiting is not the same as it is anywhere else. The two-year service requirement prevents those programs from promising a simple path to the NFL, and there are weight restrictions that keep the academies from bringing in behemoths. Army and Navy list a combined 10 players on their 2018 rosters at 300 pounds or heavier. There are advantages beyond the physical equalizers. Preparing for the option is often an endeavor that spans months, not days. Osborne says the Cornhuskers in the 1970s and 80s would spend one period each Monday on Oklahoma’s Wishbone attack. About a decade into Barry Switzer’s tenure, Osborne's teams began to slow the Sooners' offense—and by slow it, that meant keeping it under 250 yards rushing. “That was pretty good,” laughs Osborne, now 81. The option purists, who prefer to operate under center like always, are hard-nosed types. Fisher DeBerry, the patriarch of Air Force’s option, is among that number. He’s 80 now and retired in Charleston, but he gets fired up about the criticism of his fraternity and its brothers. “The ‘Y’all can’t throw it!’ is a bunch of junk,” DeBerry says. There are numbers that back him up: Over the last three seasons, Navy’s quarterbacks have twice finished in the top-10 in passer rating, and Georgia Tech and Army have at least finished in the top 30 once. It’s not that they can’t throw; it’s that they don’t. In two of the last three seasons, the five FBS teams that have thrown the fewest pass attempts have all been option teams. DeBerry helped Bill McCartney and Colorado install the triple option in 1985, three years and five wins into McCartney’s tenure there. “He called and said, ‘Things aren’t going so well. Would you help?’” Big Ten Network analyst Gerry DiNardo, then McCartney’s offensive coordinator, remembers the reaction in ’85 when his head coach announced the offensive switch during an alumni gathering. Someone in the crowd raised his hand. Coach, please tell me the first play of the game won’t be dive, the man said. “Bill looked at him and said, ‘I suggest you get to the game for the second play.’” Four years later, the Buffaloes won a national championship. Many schools don’t want the option and never will. Of the purists, Niumatalolo's name has been most often connected with Power 5 coaching jobs, with BYU, Cal Arizona reaching out in the last three years. When Niumatalolo emerged as a candidate in Tuscon, “it was panic” in Arizona, Johnson recalls. Wildcats quarterback Khalil Tate tweeted, then deleted, "I didn't come to Arizona to run the tripple (sic) option". By the end of the weekend, Niumatalolo announced he was staying at Navy, and Arizona ultimately hired Kevin Sumlin. Statesboro, Ga., loves option football like nowhere else in the country. Since Georgia Southern brought back its football program in 1982 after a 40-year lapse, the Eagles have only strayed from the scheme during a three-year stretch from 2007 to ’09 under Air Raid coach Chris Hatcher. As head coach Erk Russell’s offensive coordinator at Georgia Southern in the mid-’80s, Johnson and fellow offensive assistant Tim Stowers took a hodgepodge offense that incorporated some principles of June Jones’s Run-'n'-Shoot and the I-option. The formation, which Johnson still uses at Georgia Tech, is most similar to the Flexbone, a derivation of the Wishbone with two halfbacks positioned just behind a center or tackle, instead of in the backfield, a way to get “four receivers out quickly,” Johnson says. Now the head coach at Southwest Mississippi Community College, Stowers is in the early stages of installing the scheme that led Georgia Southern to three Division I-AA championships in five years from 1985 to ’89. The option background Stowers brought to Statesboro came from the time he spent on staff at his alma mater Auburn under head coach Pat Dye, who was once an assistant at Alabama for the Wishbone-running Bear Bryant, who got the scheme directly from the Wishbone granddaddy himself, Bellard. Yeoman and Bellard might be the creators of all of this, but Johnson and Stowers’s innovations are the ones that have stood the test of time, with the academy offenses serving as living proof. However, the path forward for traditional option offenses is surrounded on all sides by threats, including in the NCAA rulebook. A new rule this year has put the system's foundational blocking method on a path toward complete elimination. Cut blocks (blocks below the waist from the defender's front side) are no longer allowed outside of five yards from the line of scrimmage, a change that was made this spring in the interest of player safety, according to Todd Berry, executive director of the American Football Coaches Association. The NCAA did not publish data that backed up those safety concerns, but it did release a survey of FBS coaches that found a split in their opinions on blocks below the waist 10 yards from the line of scrimmage. Berry, who was in the room during the debate ahead of the latest alterations, calls 2018’s new downfield blocking rule a “data-driven” compromise among coaches, some of whom want it eliminated entirely. “ Majority of the injuries were happening on lower bodies on full speed cut blocks,” Berry says. The speed at which line blocks are delivered is important enough that Acadiana does not usually give its quarterback the option to read anything. The dive plays are called 95% of the time before the snap so the play “hits,” as the option family says, as quickly as possible. Johnson says he actually looked at moving Georgia Tech to a shotgun triple option a few years ago but ultimately decided to remain under center because plays didn’t hit as quickly as he’d like. Niumatalolo and his Navy staff have visited New Mexico and folded in elements of the Lobos’ shotgun-based triple option, which DeBesse implemented over five years under Davie after leaving Sam Houston State. New Mexico peaked in 2015 and ’16 with the first back-to-back bowl trips at the school in a decade. The shotgun-based option offense had a similar effect when DeBesse and Fritz arrived at Sam Houston State in 2010. Fritz realized in his first spring that he was taking over a program short on talent. “I told my wife, ‘We’re not going to score a point,’” Fritz says. Over that summer, Fritz and his offensive coaches scrapped their plan and partially installed a shotgun option, which blended some zone-read principals, DeBesse’s background in the Veer, the Pistol formation and pre-snap motion. The Bearkats won six games that year, then implemented the full scheme the next offseason, went 14–1 and advanced to the FCS title game. “I had people all over America calling us,” Fritz says, to learn about an offense that had been invented out of necessity. Fritz is in year three at Tulane. He won four games in 2016 and five in ’17, but his Green Wave are off to a 1–3 start this fall. Just seven years removed from popularizing the shotgun triple, Fritz and offensive coordinator Doug Ruse are still tweaking a system that defenses have already grasped. Coaches are adding new components, like the run-pass option, the latest craze in the game. Triple option and RPO in one offense? “We’ll give teams a taste of both,” says Ruse. Meanwhile, at places like Army, Monken is staying true to the old-fashioned, under-center triple option. No extra flair has been needed, as the Black Knights proved on Saturday in Norman. Doug Dotson is in his third year as head coach at Comeaux High, just six miles from Acadiana’s campus, the place where he played quarterback for his father as part of the Veer Machine. Bill Dotson used to make his son sit on the back of a chair and pitch footballs into a laundry basket for hours each summer—perhaps a drill he learned from Yeoman, the innovator he met with in 1974 to learn the split-back Veer. Bill passed in 2001 after a battle with cancer; Yeoman is 91 now and is in a daily fight with dementia, his son says. Doug Dotson had moved away from the triple option offense during his coaching career until a recent epiphany. He is in the process of installing a Flexbone-based option at Comeaux. It takes time to perfect, years even, but he hopes to build what his dad constructed across town. 1941: Missouri coach Don Faurot derives the option play from the 2-on-1 fast break in basketball. Using Faurot’s invention out of the Split-T formation, two former assistants win big at other programs: Bud Wilkinson at Oklahoma and Jim Tatum at Maryland. The Sooners win three national titles in the 1950s and go on a 47-game win streak that still stands as a Division I record. 1965: Houston coach Bill Yeoman invents the split-back Veer option by accident during practice. “They had a straight dive called and [the quarterback] saw the dive was going to be taken away, and so he pulled it and ran around the end, a busted play,” says Larry Zierlein, who later became Yeoman’s offensive line coach. “They were looking at film and said, ‘That’s really something!’” The option helps the Cougars become the nation’s most explosive offense, and they finish in the top-25 in nine of 12 years. 1968: Texas coach Darrell Royal, having lost 12 games in a four-year stretch, commissions assistant Emory Ballard to create a new offense for his plethora of tailbacks. Ballard adds a fullback to Yeoman’s two-back option attac, and the Wishbone is born. “It was the summer of ’68,” says Bob Bellard, Emory’s son. “My older brother and a bunch of his guys he was playing football with went out to the yard with my dad to practice it. That was the time in which they put it together and they presented it to Darrell Royal.” Texas wins 30 of its next 33 games. 1969: Jim Brakefield, heading into year three at Wofford having won just eight games, phones Royal for help. After installing the Wishbone, the Terriers begin the season 0–2, fumbling 11 times in one loss, then rip off 21 straight wins. Brakefield takes a new gig at Appalachian State, where he hires one of his former players, Fisher DeBerry, to his staff. 1971: Bellard’s Wishbone is all the rage in college football, leading Texas to back-to-back titles. Oklahoma’s Barry Switzer and Alabama’s Bear Bryant visit Austin, learn the Wishbone and install it at their respective programs. The coaches win a combine six national titles in 15 years, further spreading the offense. “The Wishbone then was the college football offense,” says SBNation college football writer Bill Connelly. 1975: Getting pummeled by Oklahoma and its Wishbone, Tom Osborne adopts Switzer’s scheme, incorporating it into Nebraska’s I-formation offense. It wouldn’t be until nearly two decades later that the Cornhuskers would implement the offense fully and roll to three national championships in the late 1990s, the final one led with Scott Frost at quarterback for Osborne. 1979: Larry Lacewell, a member of the staff at Oklahoma for nearly a decade, begins his stint at Arkansas State, where he uses the Wishbone to advance to the 1986 Division I-AA title game, bringing the offense further success in a different division of football. Also, Jim Wacker takes Yeoman’s Veer and wins two Division II championships at Southwest Texas State before landing at TCU, where former Southwest Texas State player Bob DeBesse joins him on staff. 1981: Pat Dye, a former Bryant assistant at Alabama, leads Auburn to seven top-15 finishes in his first nine years at the helm, using the Wishbone that Bryant bludgeoned opponents with in the 1970s. Tim Stowers is a young assistant on Dye’s Auburn staff. 1982: DeBerry, an assistant at Appalachian State under Brakefield, joins Ken Hatfield’s staff at Air Force. A year into his tenure, Hatfield and DeBerry “break the Wishbone,” moving two tailbacks from the backfield to slot positions to boost the passing attack. The Falcons win 18 games in two years, and Hatfield leaves for Arkansas, leading the Razorbacks to three 10-win seasons in five years. “[Defenses] weren’t sure what we were doing,” Hatfield says. 1985: This is a significant year in option football history. Bill McCartney’s tenure at Colorado starts with five wins in three years, so he sends assistant Gerry DiNardo out to find the best option offense. From visits with DeBerry and Lacewell, DiNardo and McCartney create the I-bone option, a mesh of the wishbone and I. Meanwhile, at Georgia Southern, coach Erk Russell hands his offense to Stowers and Paul Johnson. Stowers and Johnson combine the Run-’n’-Shoot with the ground-and-pound principles of the Wishbone to create something similar to the Flexbone, and over the next five years, the offense leads the Eagles to three Division I-AA titles. Johnson lands a job as offensive coordinator at Hawaii and then Navy before taking the top job at Georgia Southern and claiming three consecutive Division I-AA crowns from 1997 to 2001. 1991: Remember that I-bone offense that DiNardo and McCartney created? It wins a national championship for Colorado in 1990, and DiNardo lands a head coaching gig at Vanderbilt, using the option to win nine SEC games in a four-year stretch, producing some of the best Commodores teams in nearly 40 years. He stops using the option once he’s hired at LSU, for fear that it would have negative effects on recruiting in a conference that Steve Spurrier is dominating. 1999: A longtime Osborne assistant, Frank Solich lasts six years at Nebraska before he is fired despite seasons of 10, 11 and 12 wins. Solich has spent the last 14 years at Ohio, where he’s won four division championships. 2001: A young up-and-comer named Urban Meyer lands his first head job at Bowling Green. A former Davie and Holtz assistant, Meyer visits then West Virginia coach Rich Rodriguez, who has excelled with a brand new form of a double option—the shotgun-based zone read. Meyer moves on to Utah, then wins two national championships at Florida and one with the Buckeyes while perfecting and expanding a scheme that Rodriguez accidentally created during a practice in the mid-1990s while head coach at Division II Glenville State. 2007: Johnson takes his Flexbone offense to a power conference, leaving Navy for Georgia Tech, where he would lead the Jackets to seven straight bowl games. His assistant Ken Niumatalolo is elevated to the head coaching job at Navy. Using Johnson’s Flexbone, the Midshipmen have won at least eight games in eight of Niumatalolo’s 10 years in charge. Meanwhile, Troy Calhoun, a longtime DeBerry assistant, replaces his mentor as the head coach of Air Force, taking the Falcons to nine bowl games in his 11 years and expanding on the Flexbone offense. 2009: Meyer’s former offensive coordinator at Florida, Dan Mullen, begins what will be a nine-year stint as Mississippi State’s head coach. He uses the shotgun-based zone read to piled up jaw-dropping rushing numbers and 69 wins. In December 2017, he is hired away to be Florida’s new head coach. 2010: In his first year at a struggling Sam Houston State program, Willie Fritz and his offensive coordinator DeBesse mesh the shotgun spread and zone read with the old-fashioned triple option, creating a scheme that leads them to 34 wins over the next three seasons and new jobs—Fritz to Georgia Southern and then Tulane; DeBesse to New Mexico and then Georgia Southern as OC. 2012: Bob Davie, a former Holtz assistant at Notre Dame, resurfaces at New Mexico, where DeBesse brings the shotgun-based triple option that he ran at Sam Houston State. The Lobos peak with 7–6 and 9–4 seasons in 2015–16. 2017: Jeff Monken, a Johnson disciple, leads Army to its first 10-win season since 1996, using the Flexbone in its most run-heavy form, a similar offense he used to win 38 games in four years at Georgia Southern (2010–13). Brian Bohannon brings Johnson’s triple option when he is hired to start the nascent Kennesaw State football program in 2015. In its third year of existence in 2017, the Owls go 12–2 and make the FCS playoffs. Meanwhile, Frost, blending what he learned playing under Osborne with what he learned coaching under Chip Kelly, leads UCF to an undefeated season, and Clay Hendrix, in his first season at Furman, wins eight games while utilizing Calhoun’s option. At Texas, Tom Herman, Meyer’s former offensive coordinator, assumes one of the biggest head coaching jobs in the country.